There are a variety of pavilions to choose from - including Garden, Partial Ocean and Ocean views. There are also 30 villa homes to choose from ranging from 2 - 6 bedrooms, many with ocean frontage. 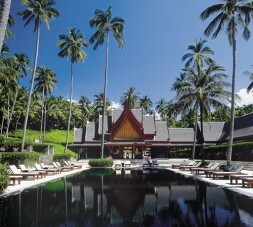 Amanpuri is located on the island of Phuket which is one of the southern provinces of Thailand. Phuket is an international airport and is serviced by many domestic and international flights. Bangkok is less than a 2 hour flight away, and has connections to most international destinations. The transfer from Phuket airport to the resort is 25 minutes, and transfers are complimentary in a limousine. Amanpuri means "place of peace". This one was the first Amanresort and was built around a coconut grove near a white sandy beach overlooking the Anderman Sea in Phuket (Thailand) in 1988. It features the first Aman Spa. Amanpuri is the most desirable and exclusive resort in Phuket. It has an unrivalled reputation as a resort that offers complete luxury, exquisite cuisine and five star personal service. Amanpuri is entirely self-contained on a verdant peninsula sloping down to Pansea Beach and its pristine, sheltered cove. Amanpuri offers a variety of villas for your holiday - The villa homes come with a private pool and a maid and cook to look after your every need while you relax in luxury. The resort’s pavilions are 115 square metres each, including the private outdoor terrace. Pavilion rates are determined according to view and location. All pavilions feature an outdoor sala, a king-size bed, separate bath and shower, refrigerator with fully stocked minibar, electronic safe, stereo CD cassette system, IDD services and wireless broadband connections, also available in public areas of the resort, and air-conditioning. Pavilions 105 and 103 enjoy the best views of the Andaman Sea. The resort is set in a coconut grove and it advocates a lifestyle approach to wellness. The Aman Spa opened in 2001 and has three double rooms for couples and three single rooms. Each room has a sauna and steam room. There are also grass and hard tennis courts, and a private fleet of 20 cruisers and sailing craft (the largest of any hotel in Southeast Asia).